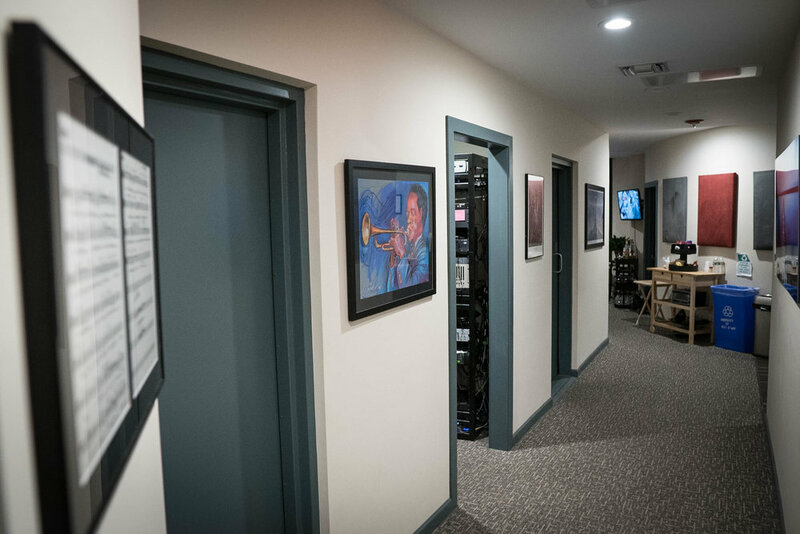 We built Sandblast as a creative environment where creative people could play—sing songs, record VOs, mix films, promos and commercials, and track string quartets & horn sections. It's a studio where abundant curiosity and imagination are not only welcomed, but encouraged. This is our hallway! At the end are all sorts of tasty snacks and a well-stocked bar. Also, around the corner a lounge where you can read a book (remember those?) and listen to a record (what's a record?!). To the left are our two mix rooms and VO booth. To the extreme left, somewhat blurry, is a piece of music that Arthur Miller—yes, THAT one—wrote for one of his plays, The American Clock. He signed his copy and gave it to Loren, who music-directed the show. There are only two of these that exist in the world, and we welcome you to see ours when you stop by. The entrance to the studio! 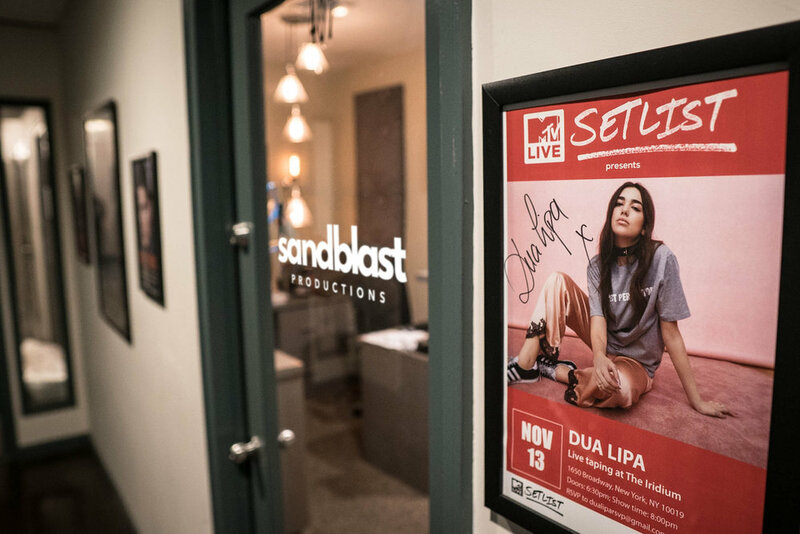 There's a poster of Dua Lipa on the wall from the MTV show she performed at The Iridium Club downstairs, which we captured and mixed. We also captured and mixed a number of Front & Center shows, featuring Rob Thomas, Steve Vai, Muna, Jennifer Nettles, Dawes, Joe Jackson, and Sheryl Crow, among others. Those posters are hanging on the wall, too, along with the big poster from The Lennon Report, a feature film we recently scored and mixed.